There is no future without research! That is the stark message that Pro-Test Italia will be taking to the streets of Rome on Thursday 19th September 2013, when will be staging their 2nd major rally in support of animal research and medical progress. The need for such a rally could not be more urgent. Despite the success of Pro-Test Italia’s first rally in Milan in June- which sent a strong message that vandalism of scientific research would not be tolerated – there has been little to the cheerful about in the news from Italy in the months since. Last month the Italian Parliament approved a series of amendments – referred to as Article 13 – to the to EU directive 2010/63/EU on animal research. In an interview with the newspaper La Repubblica, Niccolò Contucci, director general of leading Italian cancer research charity AIRC, was clear about the impact the proposed amendments would have. There is still a chance to stop these amendments being implemented. As we discussed in a post on this blog last month many politicians began to belatedly realise the damage the amendments would do to many crucial fields of medical research, from transplant science to cancer research, and while impending penalties from the EU meant that the bill transposing the EU directive into Italian law was passed along with the amendment. Fortunately in doing so the parliament gave the Italian government considerable freedom in implementing them, and the government now has the opportunity to reject the most damaging amendments as they actually contravene the EU directive itself! So what will the government do? So there is a chance for Italian science to avoid going over the cliff, but it will take a concerted effort by supporters of medical research in Italy to make sure that its future is secured. This is where the Pro-Test Italia rally in Rome fits in, it is the perfect opportunity to let Italy’s political classes know how many people value the role of animal research in advancing medicine, and are ready to fight to defend it. If you will be in Rome or its neighbourhood on Thursday 19th September, or have colleagues or friends who will be there, we strongly encourage you to join the crowd in support of medical progress at the rally, which will be held in via Colonna Antonina (Montecitorio), from 15.30 and 18.30. You can find out more about the plans for the rally, which is being backed by several leading Italian and European research institutes and scientific associations, on the Pro-Test Italia website (in Italian) and on the Facebook page for the event. It’s time for science in Italy to make a stand! Pro-Test Italia will be there, will you? Previous Previous post: Trial of gene therapy in heart failure launches following success in rats and pigs. 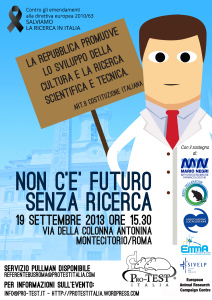 Next Next post: As Italy prepares to rally for science, science rallies for Italy!